A “disenabler” (also known as a “key voice”) is a person who keeps you from doing drugs or from drinking. I saw my first disenabler at a party given by a producer last February in honor of his new mountainside home in Beverly Hills, an eccentric 35-room pile that looks like Mount Vernon descending Benedict Canyon. As the producer’s wife was showing me around, I watched my host, a dapper fellow in his 50s, being followed around by a weather-beaten guy about the same age dressed in jeans, jersey, and a baseball jacket that had the initials “S.O.B.” sewn on the back. The producer and his follower eventually came by and the producer said to me, “Great place isn’t it? Meet Charlie.” I shook hands with Charlie. The two strolled away. “Is Charlie somebody I should know?” I asked the producer’s wife, fearing that I might have insulted some studio face card or other local figure of consequence. Elsie wasn’t the only surprise of the evening. When it came time for the band to play, the bar was shut down. In keeping with the new ethos, it turned into a cocktail-less cocktail party. BETTY FORD, FORMER first lady, recovering alcoholic, and founder of the Betty Ford Center for the treatment of alcoholism and drug abuse, is the one to thank for these sights. And I do mean thank; through her center and her work, she relieves much misery and despair. Leo’s personal puritan and the nonalcoholic cocktail party are comic instances in Los Angeles’s persistent belief that everything in life, from achievement to personal tragedy, is of no consequence unless it can be purveyed stylishly and publicly. Mrs. Ford is not to blame if there is such a thing as addiction à L.A. mode. The center started by Mrs. Ford, to which they’re all flocking, is a 14-acre institution at the giant Eisenhower Medical Center in Palm Springs. The elaborate hospital was constructed after we nearly lost Ike in 1956 because then-existing Palm Springs hospitals weren’t adequate to his heart condition. The hospital has blossomed since then, and has become a favorite stopping place, especially for Republican first families in need of medical attention. The spirit of philanthropy aimed at resolving the distempers of famous Republicans can be expected to soar in the future. Centers dealing with the morbidities of more recent first families are now being proposed. I understand that the president and Mrs. Reagan will be honored with the Dutch and Nancy Reagan Sugar Tolerance Impairment Pavilion to make the world safe for jelly bean eaters. Not far behind are the plans for the Pat and Richard Nixon Dermatology Wing for further studies in thick and thin skins. Meanwhile, a stay at the Betty Ford Center is all science can do for someone suffering the diseased life-style of the rich and famous. The Betty Ford Center, which was opened in 1982 at a cost of $5.8 million (all raised privately), is described as “a chemical dependency recovery hospital.” Inpatient treatment lasts about six weeks and costs about $150 a day. About 1,900 patients have been treated there since opening. A good many have been celebrities. The center won’t release the names of patients, but a careful scrutiny of The New York Times, The Los Angeles Herald, and The Washington Post reveals that Elizabeth Taylor (she was the first), Mary Tyler Moore, the late Peter Lawford, Johnny Cash, Tony Curtis, Liza Minnelli, and Andy Gibb are among the clientele. According to spokesmen for the center, the treatment program, which also requires members of the patient’s family to come in for one week, combines medical care and group therapy. It is designed to help patients stay away from drugs and liquor, to reconstruct their emotional lives, and to involve themselves after hospitalization with chapters of Alcoholics Anonymous, Cocaine Anonymous, and other self-help groups. Patients live in clusters of 20 (there’s only room for 60 at any one time) at the hospital and spend virtually the whole day in the residential wing. They have private rooms with patios, but share living spaces, and do all the household cleaning themselves. It’s a treatment program, not unlike the one at Long Beach Naval Hospital that Mrs. Ford underwent in 1978, except that at the Betty Ford Center, the program was redesigned to be of especial value to women. “Most facilities dealing with chemical dependency problems are geared to men,” a center official said, “and even in coeducational treatment groups, women are more likely to focus on the men and stay locked into their traditional role of nurturing others and putting the needs of others before their own.” So a portion of the program and one wing of the center are designed just for women. “In this program,” said the spokesman, “we emphasize the dangers of overmedication that women, especially upper-middle-class women, face. Too often their physicians prescribe pills when some other kind of therapy is called for—usually psychotherapy. And we try to train women to gear up for their own independence, how to eliminate anger, how to eliminate guilt over children, and general survival skills. HOW THE BETTY FORD Center began to attract celebrities has something to do with how Mrs. Ford has helped transform the public’s perception about the nature of alcohol and drug treatment facilities. SOME WEEKS LATER, sober and enlisted in Alcoholics Anonymous, she emerged from the hospital, determined to do something for people, especially women, who were similarly afflicted. She felt some bitterness against the medical profession for treating women with pills and shots, and toward society for encouraging vast amounts of social drinking. (She cites “magic martinis” served in the White House.) The Betty Ford Center was born. Enter the redoubtable Elizabeth Taylor in late 1983. Like many celebrities who drink or use drugs, Taylor was hospitalized for treatment under a pretense. 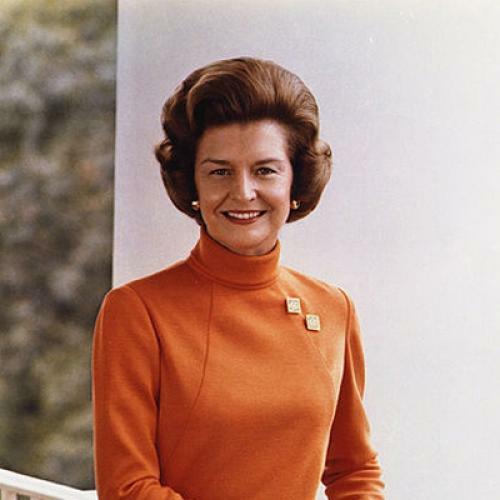 She was ostensibly admitted to a California hospital for “a bowel obstruction,” But during her stay she was persuaded by family and friends to enter the Betty Ford Center, The thought terrified her and her public relations staff until they talked things over with Betty Ford herself, who remains active as a counselor at the center. The message of the Betty Ford Center—“We are the abused, not really the abusers”— won Taylor over. Most celebrities issued similar statements as they went into the center—even though many of them weren’t hooked on prescription drugs, but on street drugs like cocaine and heroin. It didn’t matter. They all qualified as victims. Mrs. Ford and Taylor took recovery very seriously, and each, shortly after entering her program, gave up the prone posture of victim. Taylor no longer blamed medications. She said she was a drunk, “Not being a drunk is the only way I’m going to stay alive,” Taylor told The New York Times recently, “Drunk is a hard word, but I’ve had to be hard with myself to face it. A drunk is a drunk. Somebody who drinks too much is a drunk. Somebody that takes too many pills is a junkie. There’s not a polite way of saying it.” Addiction chic was born. Hollywood, ever the home of trends, was fascinated by Taylor’s admission. “She made being a drunk into a sickness,” says a Beverly Hills PR man, “and she made it no sin to be sick.” Shortly after being released from the center, Taylor’s career took a turn for the better, especially on television. Along with cameos on the evening soap operas, she signed a $500,000 contract for a made-for-TV movie called Malice in Wonderland, in which she portrayed Louella Parsons, the Hollywood gossip who ruined the career of many a star by hinting in print at their liquor and drug problems. And, not to neglect a point of paramount importance in Hollywood, she looked great. She lost 11 pounds in the center, and quickly lost 45 more. She began showing up at Michael Jackson concerts, at Prince concerts in a punk wig, on Broadway, and everywhere else. Other stars soon followed her to Betty’s door. The other patients, wrestling with their problems and undergoing detoxification, were nonetheless star-struck. Some brought autograph books to the hospital, creating a difficult situation for a program where anonymity is a key principle of recovery. Taylor solved the problem, though. Upon admission, each patient is given a volume called “The Blue Book,” a kind of “Lives and Acts of the Apostles” of Alcoholics Anonymous that contains brief biographies and memoirs by A.A. members about their struggles. The authors are identified by first or nickname only. Taylor inscribed the end papers of these books with a mere “Love, Elizabeth,” The patients cherish these volumes. Taylor also secured an acting job for Lawford, who was broke, in Malice in Wonderland. Lawford’s deal called for him to do two days’ work for $2,000, a pittance, but still cash. Six months later, just a day or two before he was to report for work, Lawford’s wife found him drinking vodka and smoking a joint. “He seemed terrified of going in front of the camera,” his wife told reporters. “When I found him he was completely out of it,” Lawford was treated at a hospital, and sent off to work. He collapsed on the set, and within a few days was dead. This article originally ran in the July 8, 1985 issue of the magazine. Politics, the New York Times, Los Angeles, L.A., Alcoholics Anonymous, Elizabeth Taylor, Betty Ford, Nancy Reagan Sugar Tolerance, Louella Parsons, Richard Nixon, Liza Minnelli, Peter Lawford, Ford is, Reagan Sugar Tolerance, Sinai, S.O.B.